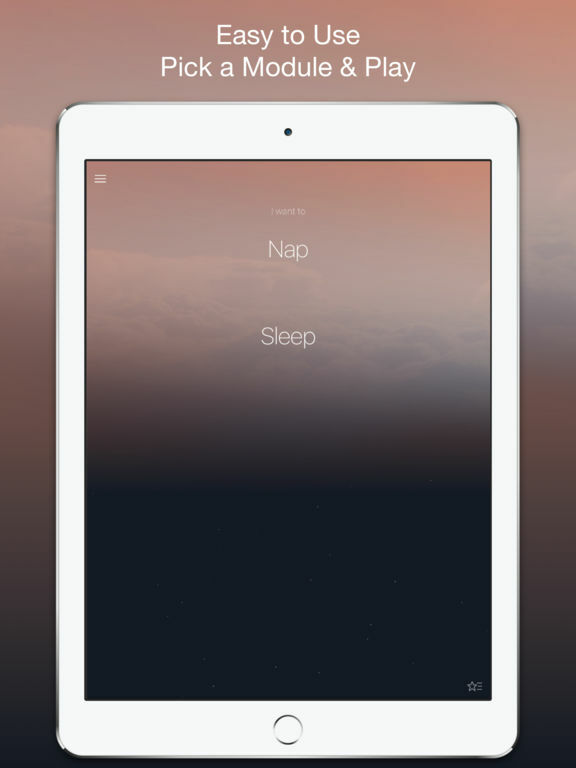 Pzizz - Sleep at the push of a button! Sleep at the push of a button! Fall asleep fast, stay asleep & wake up refreshed. Pzizz delivers sleep at the push of a button! Using the science of psychoacoustics (see our website for in-depth details), the app's patented algorithm plays you a sleep-optimized mix of music, voiceover, and sound effects to quickly quiet your mind, put you to sleep, keep you asleep, and then wake you up feeling refreshed. If you want to sleep better at night, or take incredible power naps during the day, this is the app for you! All you have to do is listen to Pzizz. Headphones/earbuds are recommended for optimal effectiveness, but your built-in phone speaker will work too. *Side Effects* Our only side effect is sleep! Unlike medications or supplements, you’ll never have to worry about adverse effects. *Variety* Every time you tap "Start," Pzizz creates a different session for you to enjoy. This ensures your brain doesn’t get fatigued from hearing the same things over and over again, and helps ensure effectiveness over time. *Highly customizable* Adjust sleep duration, volumes, voice gender, or add a 3D effect for a fully personalized listening experience. Once you download the app there is a 7-day free trial that will allow you to see if Pzizz works for you. The free trial does not require a credit card. If you choose to continue using Pzizz we will offer you three subscription options: $9.99 per month (auto-renew), $99.99 per year (auto-renew), $239.99 for three years (does not auto-renew, for those customers that are in it for the long haul!). These prices are for United States customers. Pricing in other countries may vary and actual charges may be converted to your local currency depending on the country of residence. Your Pzizz subscription will automatically renew at the end of each term and your credit card will be charged through your iTunes account. You can turn off auto-renew at any time from your iTunes account settings but refunds will not be provided for any unused portion of the term. If you choose not to subscribe to Pzizz you will still have access to “Pzizz Classic” features, that include the original sounds and features from the hardware, desktop and previous mobile apps.